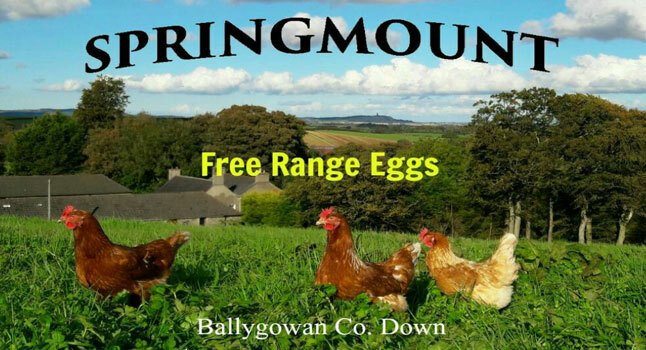 Springmount Farm supplies leading local Hospitality and Retail Businesses including La Mon Hotel , Salty Dog and Mill Brook Lodge Hotels. They also are sole suppliers to Avoca and French Village Restaurants in Belfast. From the farm gate; Costcutters, Ballygowan; Jacksons; AVOCA Food Store, Belfast; French Village Bakery & Patisserie Lisburn Road Belfast; Saintfield & Comber Farmers’ Markets; Toasted Artisan Kitchen, Carryduff; Lock Keepers, Shawsbridge and Saints Café, Saintfield, Centra, Hillsborough; Supervalu, Lisburn.